Sitting At The Foot of the Mountain: Take Flight! This picture captures it all: a beautiful hawk taking flight. My son took this picture the other day. 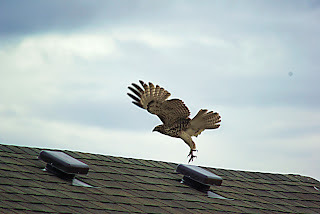 This hawk (we believe it’s either an osprey or a red-tailed hawk in light phase) was perched on the roof of our shed. James ran (quietly!) into the house to get the camera, and just as he made ready to take the shot, it flew off. We are proud of this shot, because taking pictures of birds is no easy task! It sits up on the roof, watching its domain with a beauty and dignity that these magnificent birds possess in spades. It sits there often, and as I drive up our driveway, I love to see it there. It reminds me how easily grounded we can become, and yet how we can take flight in Him. Wow: that is the voice of someone who is grounded: held to the earth by pain and indignation that the Lord is somehow forgetful or dismissive of the cries of His children. The way to counter the feeling the God is nowhere to be found, is to be reminded of the character of God: He is and will always be, and is not subject to our failures or weaknesses. He cannot grow tired or weary, and it may appear that His apparent silence is neglect—but His wisdom is such that He knows our needs. He is moving, even if our timing and His don’t match. Here’s this key: “hope in the Lord”—the best way to untether yourself and take flight is to put your hope in Him. Why? Because of His character: Who He is. It is hope in Him that makes those feelings that overwhelm us to lessen their grip. It is hope in Him that allows us to spread our wings. That hawk knows that when it throws its wings wide open, it will fly. It won’t fall down to the earth. It relies on its past experience that open wings mean flight. So, we need to remember how God has worked in our lives in the past, and read His Word to gain greater insight to Who He is. The hope in the Lord reinvigorates our strength, and with renewed strength, we can take on the tasks that await us with joy and power. But notice one thing: nowhere do these verses tell us that we will feel these things first, and then move forward. No: we put our hope in Him and His unchanging character. Who He is will remind us of His faithfulness to us and throughout the history outlined in His Word. We stand on His promises, not on our feelings. Feelings are a lot like toddlers: they doddle along, and make us slow down. But grab those toddler feelings by the hand of hope, and bring them along. Eventually, the feelings will come into line, but meanwhile we are standing on His promise of renewal and strength. Take flight and know that He is the wind beneath your wings. Heavenly Father: I am grounded, with my feet bound to the ground. But this hawk reminds me that heaven awaits, and Your promise to provide renewal and strength still stands. Help me to open up my feeble wings that droop with disappointment, and trust You as I head skyward. In the name of the One Who Never Changes, amen.